Commemorate all of life's memorable moments with this "Let the Adventure Begin" Airplane Bottle Opener. Your adventure is about to begin, so thank your friends and family for gathering to celebrate with you. 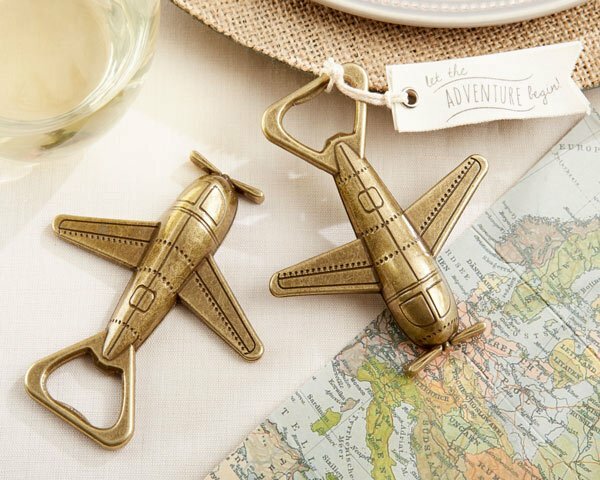 The airplane design metal bottle openers feature a vintage antique bronze finish and attached fabric hang tag that reads "Let the Adventure Begin!". Brides tell us that "my guests loved this design" and it "completely matched my theme even though it wasn't travel related" because "these go well with anything". They were happy that "the bottle openers are much sturdier than they look" and "the personalized tag option made it feel unique". Note: The optional personalized tag is paper. Some assembly is required to attach them to the favor. Product dimensions: 3.56" H x 3.18" W.
What is the size of the tag attached? The airplane bottle opener has two tags attached. One is fabric that reads, let the ADVENTURE begin! and the other one is paper but both tags do not have blank backs to write anything on them, just FYI. Both tags are about 2.25" width and not quite 1" H.
I want to order 25 of the airplane bottle openers but I don't know why the website is asking questions about design. You can directly order the Let the Adventure Begin Airplane Bottle Opener online. You have the option to order personalized tags for an additional $0.35 each. You will be able to use the personalization/design tool in the cart to see a preview of these tags. Can I get each bottle opener in a gift box for an extra cost? Can I get the the tag personalized with our names? Yes, you may add personalized tags for an additional cost of $0.35 each for these Let the Adventure Begin Airplane Bottle Opener. I am looking to purchase an item with a tag but it also gives me the personalization option. Is this an additional tag? Yes, the standard tag that reads "Let the Adventure Begin!" is included at no additional charge and the optional personalized tag is $0.35 each and some assembly is required if you choose to add the personalized tag. I didn't receive my tags with my Let the Adventure Begin Airplane Bottle Opener order. The personalized tags of the Let the Adventure Begin Airplane Bottle Opener do not come attached to the product. They are in a separate envelope and should be inside your shipping box. Please empty the box(s) completely. The Let the Adventure Begin Airplane Bottle Opener is sold individually. The price would depend on the number of items you will purchase. I want to make sure that the message "Let the Adventure begin" is included if I personalize it. The Let the Adventure Begin Airplane Bottle Opener includes a fabric hang tag that reads "Let the Adventure Begin!". You also have an option to add a personalized tag paper where you can add names and date of the event. I am ordering the airplane bottle openers for rehearsal dinner favors. It asks if I want to personalize, but I am not sure what I am personalizing. You have the option to add personalized tags for an additional $0.35 each. If you don't want them added, you will still receive the standard "Let the Adventure Begin" tags that are pictured. So I am trying to figure out how to order the plane when it say [email protected]$3.38... is it $3.38 per one pair or for 23 pairs? If you buy 2 to 23 favors of the Let the Adventure Begin Airplane Bottle Opener, you can get it at a special price of $3.38 each favor so say you want to buy 20 pieces it's $67.60 not including shipping fee. If I order the personalized tags, do the openers still come with the fabric 'Let the Adventure Begin' tags? I read some assembly is required for the personalized tags - is this simply to attach them on the string already provided? Thanks! Yes, it includes the fabric hang tag that reads "Let the Adventure Begin!" and you also have an option to add a paper personalized tag where you can put a name and date but some assembly is required to attach them to the favor. How is this "Let the Adventure Begin bottle opener" packaged? This Let the Adventure Begin Airplane Bottle Openers are bulk-packaged (not individually gift boxed) and include the standard "Let the Adventure Begin" tag. You also have an option add a personalized paper tag for an extra fee of $0.35. I would like to confirm that the Let the Adventure Begin Airplane Bottle Opener comes with the attached tags included in the price being offered? The fabric hang tag that reads "Let the Adventure Begin!" is included in the price offered but if you want to add a personalized paper tag, you will need to pay extra $0.35 for that. 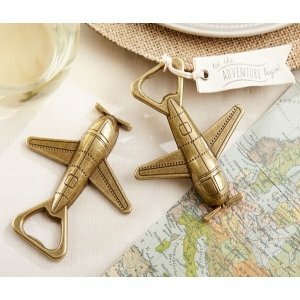 I am looking to order the "Let the adventure begin Airplane" Bottle opener as favors for my wedding. Does the "let the adventure begin" tag that is in the picture arrive already on the bottle opener? Yes, this airplane design metal bottle opener includes the tag that reads "Let the Adventure Begin!". You also have an option to add a personalized paper tag but some assembly is required to attach them to the favor. How can I personalize a sample of this bottle opener?